First, the material. What is it? A soft sandstone quarried in northern New Jersey and Connecticut and shipped by barge to New York City to be used in the construction of row houses. It served chiefly to cover the houses’ brick façades; brownstone residences, like the Greek Revival houses before them, were basically built with bricks. A brownstone on the Upper West Side. In Manhattan, in the 1850s and 1860s, when the Italianate style was in vogue. By the 1880s brownstones were being built on the Upper West Side of Manhattan, where Queen Anne and Renaissance styles replaced the earlier and simpler Italianate. And throughout the rest of the century brownstones were being built in various neighborhoods of Brooklyn, their façades adorned with bay windows and balconies. · A steep front stoop, thought to be stately and elegant, though it took energy to negotiate it; ascending, one supposedly left the hurly-burly of street and sidewalk life behind and accessed something nobler and more genteel. · An impressive front doorway with double doors topped by a rounded arch and a projecting hood and flanked by pilasters, informing all who managed to get up the stoop – formal callers, ministers, doctors, lawyers, and such -- that this was a residence of wealth and refinement. · A basement door under the stoop to accommodate the lower orders: deliverymen, tradesmen, servants, and other social inferiors. · A basement (sometimes called a garden floor, since its rear door led out to the garden) and four stories. · Handsome cast-iron railings for stoops and area fences. · A flat roof with a boldly protruding cornice (the horizontal projection at the top of the building), providing a sharp limit to the structure’s monumental rise. · By the 1860s, a steeply sloping mansard roof installed above the cornice, a hot new architectural feature imported from Second Empire France, adding a fifth story with dormer windows. · A parlor floor with three parlors, each one with sliding doors opening into the next, the first two often serving as a single deep parlor and the last as a dining room, the food coming up from the kitchen below by that marvelous new invention, the dumbwaiter. · Folding wooden shutters to shield the parlor floor from the view of nosy passers-by who, looking up from the sidewalk, could at best see only a patch of ceiling and maybe a chandelier (I know, because I’ve tried). · Ornate decorations sculpted in the brownstone, foliage and cutesy little animals and strange mythological faces and scrolls and curlicues. What amenities did they have? · Heat: A coal-burning furnace in the cellar, generating hot air that was conducted in pipes to the lower floors, and coal-burning fireplaces for the top floors where servants resided. Coal provided a steady heat far superior to what wood-burning fireplaces had once provided. · Lighting: Gaslight for the lower floors, kerosene lamps for the upper floors with the servants’ rooms. Oil was discovered in Pennsylvania in 1859, making kerosene readily available, since it is obtained by distilling petroleum. The kerosene lamp then replaced the whale-oil lamp. · Running water: Since 1842, when the city began getting clean water from upstate reservoirs, anyone who paid the water tax could have running water in their homes. The result: indoor plumbing providing plentiful water for cooking and dishwashing, for shower baths and tub baths whenever you liked, and for that miracle of modern miracles, the flush toilet, replacing primitive improvisations that I don’t have the heart to describe. From 1842 on, soap sales presumably went up, while perfume sales declined. All over Manhattan a joyous chorus rose of showering burgers reveling in the miracle of running water. No wonder nineteenth-century Americans believed in Progress. But tenement dwellers still had to rely on the well in the yard and tote their water in. What was a brownstone parlor like? Volumes could be written … and have been. The Victorian parlor was the shrine and sanctuary of the affluent middle class, its best stab at propriety, calm, and culture, its chance to put its best foot forward. Plush and velvet abounded, Brussels carpets ran from wall to wall, elegant little spindle chairs dared intruding males to risk their bulk upon them, and antimacassars pinned to the backs of overstuffed sofas and armchairs protected the sacred upholstery from masculine locks reeking of Macassar oil. More ornamental now than essential, white marble fireplaces gave off a lustrous sheen, and over them the mantel featured a large bronze or marble clock backed by a gilt-framed mirror rising five or six feet, or even eight feet all the way to the ceiling. No pianoforte here, but lots of ancestors. From the walls ancestors in gilt frames stared dourly down, or perhaps, more benignly but grandly, the master and mistress of the house. Displayed prominently was that inevitable symbol of bourgeois refinement, the pianoforte, its gleaming ivory keys awaiting the deft fingerings, at family gatherings, of the young ladies of the household, nervously anxious to reveal their accomplishments. Cluttered on whatnots were assorted bibelots, framed locks of the dear departed, and stuffed birds under glass. A cool gloom prevailed, and by day shades or drapes were drawn, and shutters closed, lest sunlight smite the damask. Here, in an atmosphere scented with cedar and cinnamon and lavender from pomanders and potpourris, the mistress of the house presided; children were to be seen but not heard; and males of all ages were on their best behavior, never quite at ease, their conversation scrubbed and disciplined. Loud talk was discouraged, arguments banished, smoking forbidden; gentility reigned supreme. The dining room, the back parlor on the parlor floor, matched the front parlor in elegance and refinement; here, attended by servants, the family could dine in state. On the second floor the front room was often a sitting room or library where the family could gather casually and relax, without the formality required by the parlor; it was the forerunner of today’s living room. (The parlor, on the other hand, has no equivalent today; it disappeared with the Victorian mores that created it.) The back room on the second floor was the parents’ bedroom, featuring an imposing four-poster and having access to a bathroom that, in some instances, was regal in splendor, with a marble or mahogany washstand with gleaming silver-plated faucets, a commode of polished porcelain, and a polished metal or marble tub; the air was scented with fragrant powders and soaps. With five floors and up to sixteen rooms, a brownstone afforded privacy to parents, children, and servants, but at the cost of endless climbing and descending stairs. Brownstones were not for the weak of limb, though an ailing master or mistress might install themselves, bed and all, on the parlor floor and receive callers there in state. Are there any old brownstones left on Fifth Avenue? To my knowledge just one, at 47 Fifth Avenue, between East 11th and 12th Streets in the West Village. Built in 1853 as a residence for Irad Hawley, the first president of the Pennsylvania Coal Company, and his wife, it showed the world that the Hawleys and their coal business were doing quite well. And how could they not be? Coal was in great demand for heating interiors, and for powering both the many palace steamboats gliding smoothly over the Hudson, and their screechy upstart rivals, the railroads. The building’s exterior still has the classic features of the early Italianate brownstone: an imposing stoop rising to an entrance with double doors flanked by pilasters and topped by a rounded arch and a projecting hood; tall parlor-floor windows; and four floors topped by a cornice. 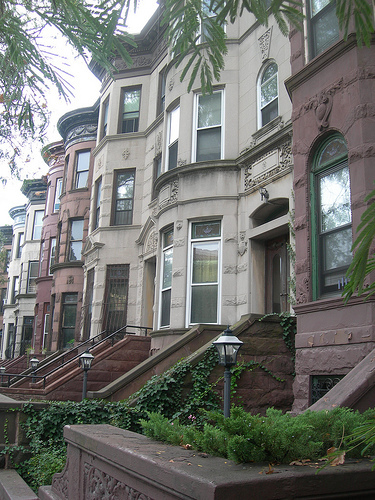 The stoop, however, isn’t centered, having two parlor-floor windows on the right, and one on the left, with balconies. Inside, some vestiges of the old brownstone remain, notably the two front parlors joined into one, each with a white marble fireplace with foliage and figures in relief, and a chandelier suspended from a ceiling rosette; between the parlors are four Corinthian columns with elaborately carved capitals. One can well imagine the Hawleys receiving guests in front of such fireplaces aglow with coal, under chandeliers ablaze with gaslight. Since 1917 the building has housed the Salmagundi Club, a nonprofit center for artists and collectors that offers art classes and exhibitions. In Manhattan, taste changed. What looked fashionably dark and “Romantic” in the 1850s came to look like cold chocolate, dingy and depressing. When the Vanderbilts and Astors and other moneyed clans built their mansions on the Upper Fifth Avenue from 1880 on, they preferred brighter limestone residences in the French-chateau style. But brownstones continued to be built on the Upper West Side in Manhattan, and in many neighborhoods in Brooklyn, where they sprouted balconies and porches and bay windows alien to the formal and rather severe earlier Italianate style. By the end of the nineteenth century, however, people were complaining about soft brownstone crumbling and cracking and flaking, which further doomed brownstone construction. Since then, many brownstone façades have been replaced with brown cement-based masonry, a cheaper alternative. Still, brownstones had a certain aura that persisted, and the second half of the twentieth century saw a brownstone renovation movement take hold in older cities throughout the East, often with impressive results. What happened to the brownstone quarries? The last New Jersey quarries ceased operation in the 1930s, owing to lack of demand. When the quarries in Portland, Connecticut, were flooded by a 1936 storm and proved impossible to drain, they shut down. In the mid-1990s a geologist named Mike Meehan reopened the ground on the edge of the Connecticut quarries and sold brownstone for historic and restoration projects and lavish private homes. But in 2012 his quarry, the last of its kind in the region, finally shut its doors, to the great regret of preservationists trying to match the brownstone of old residences; it marked the end of an era. But in his retirement Meehan, a true lover of brownstone, planned to use some of the remaining little slabs to make birdbaths and benches, not to sell but for the fun of it.